Any rockhound worth their salt knows that the best place to hunt for interesting minerals is in the void spaces in rock. Void spaces come in two types; vugs and veins. 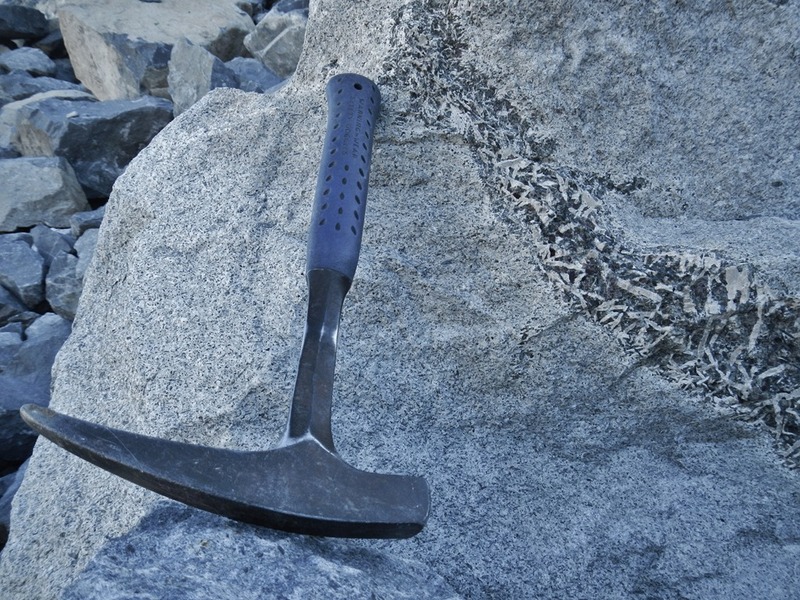 Vugs are usually found in igneous rock and result from trapped gas bubbles. Veins, on the other hand, can be found in any type of bedrock. Veins are fractures, that have been plugged with minerals, typically by precipitation from circulating water. 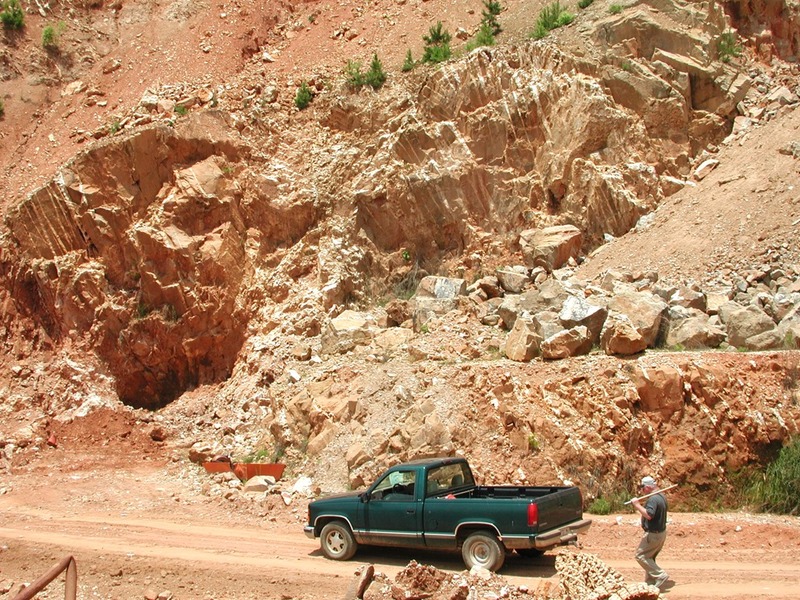 The above picture was taken in the Ron Coleman quartz mine, near Hot Springs, Arkansas. The near-parallel white streaks that riddle the sandstone are quartz-filled veins. The fractures resulted from the intense deformation of the Ouachita Mountains, by plate tectonic forces, around 300 million years ago. That deformation opened up space for quartz to grow in, and the tremendous heat and pressure from the mountain-building generated the mineral-rich fluid that deposited the crystals. This entry was posted in #geoblog, GeoPic of the Week and tagged Crystal, Hot Springs Arkansas, Mineralized, minerals, Quartz, Quartz mine on December 22, 2017 by argeology. 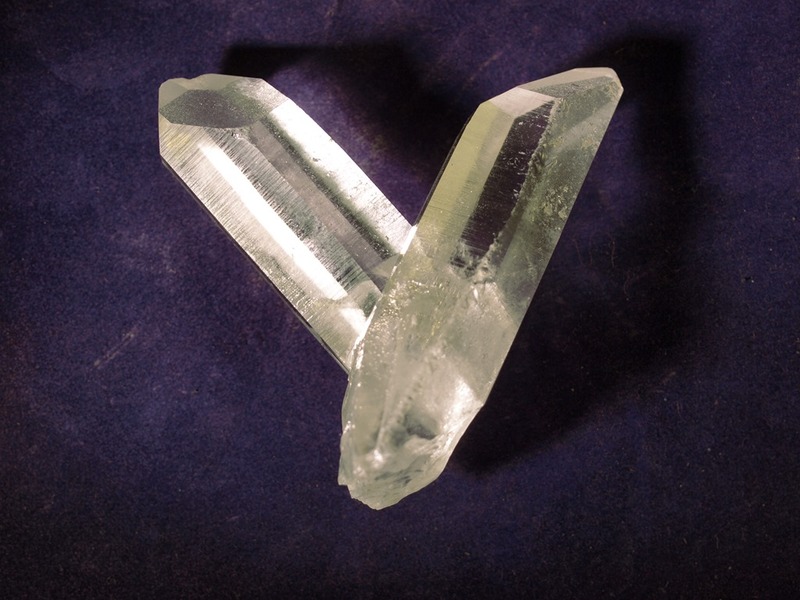 This large quartz vug, or cavity, (approximately 3 ft wide x 3 ft high) was extracted from one of the Coleman Quartz Mines and brought to the Arkansas Geological Survey Learning Center in the 1980s. This vug was found in the Crystal Mountain Sandstone (Early Ordovician, 485-470 mya), a massive, coarse-grained, well rounded, light gray sandstone from Montgomery and western Garland Counties, Ouachita Mountains. 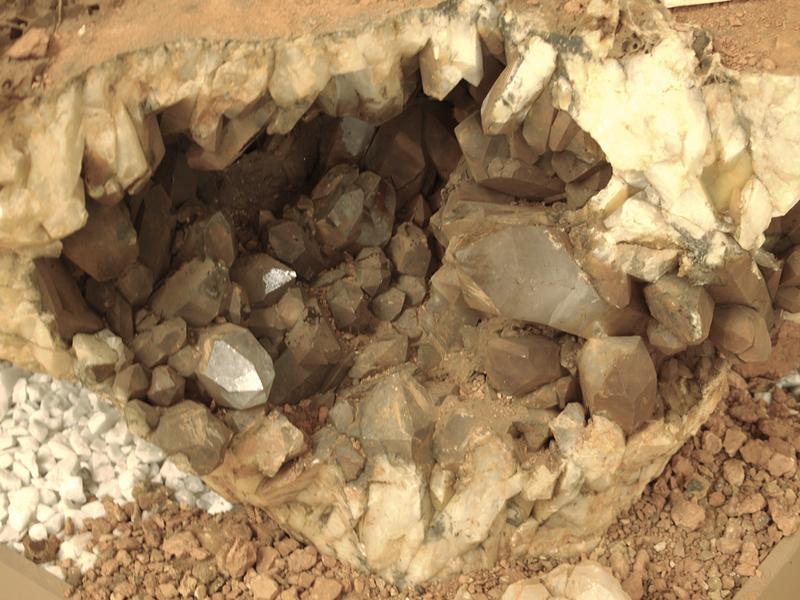 These quartz crystals formed secondarily from silica-rich fluids that resided within this large cavity. 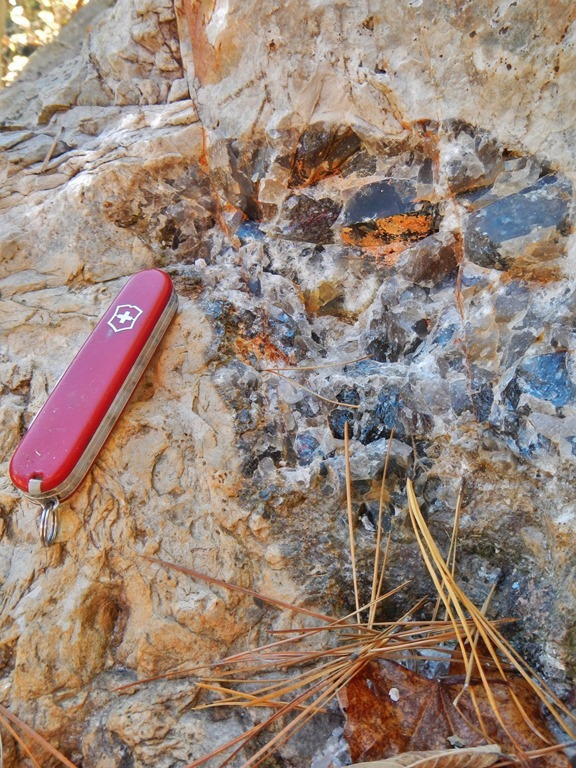 This entry was posted in GeoPic of the Week and tagged Cavity, Crystal Mountain Sandstone, Ordovician, Quartz, sandstone, silica-rich fluids, Vug on June 19, 2014 by argeology. Another great week in the field. 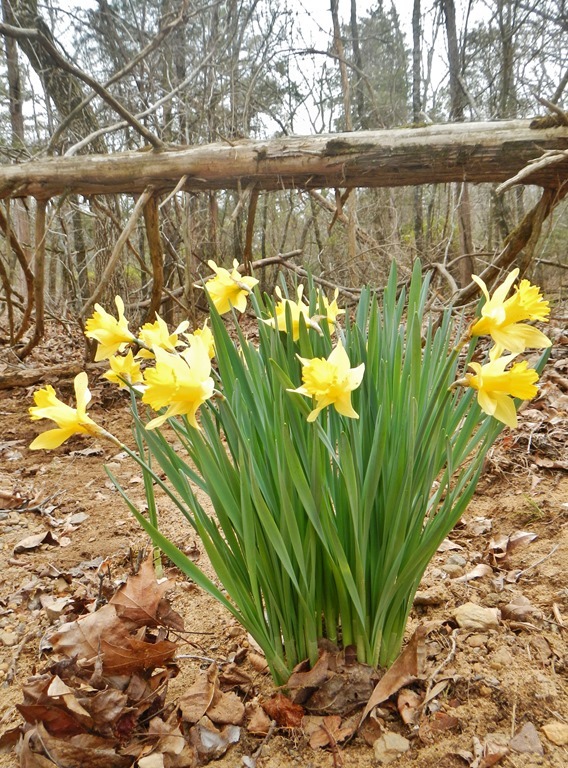 Signs of spring are everywhere, and unfortunately the field season is drawing to a close. We skipped around all over the Fairfield Bay quad this week, still trying to trace the very thick-, massive-bedded sandstone that we’re calling the base of the Bloyd for now. Just off the eastern edge of the Fairfield Bay quad is a locally famous outcrop of that sandstone that was supposedly visited by Hernando Desoto himself in 1542. Whether or not that’s true, it is a very impressive bluff shelter known as the Indian Rock House. A lot of eroded material was removed from the floor of the shelter when the adjacent Indian Hills Golf Club was built, leaving behind the fine sandstone amphitheater we see today. One could see how this formation could later become a natural bridge if erosion continues along the joint set parallel to the bluff face. If that interior arch were to fall out, then the remaining one would form a bridge. 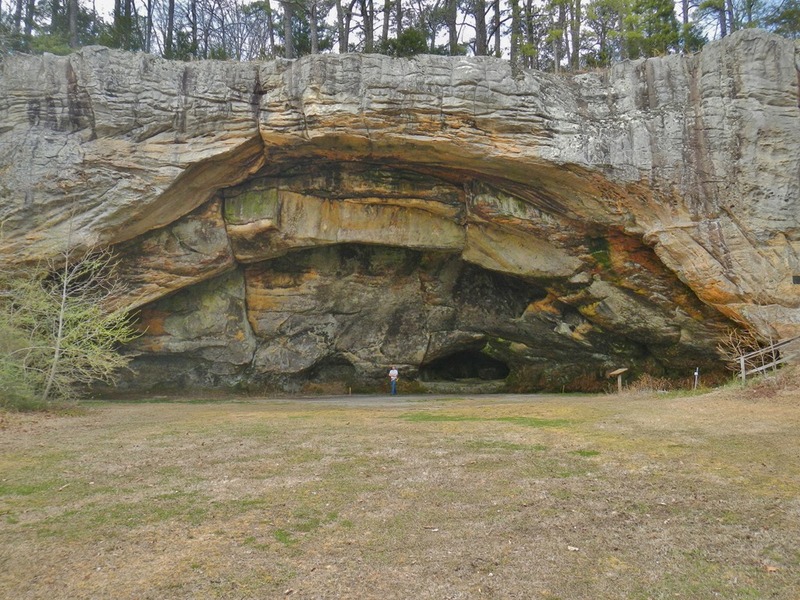 This is how most of the sandstone natural bridges in Arkansas are formed. 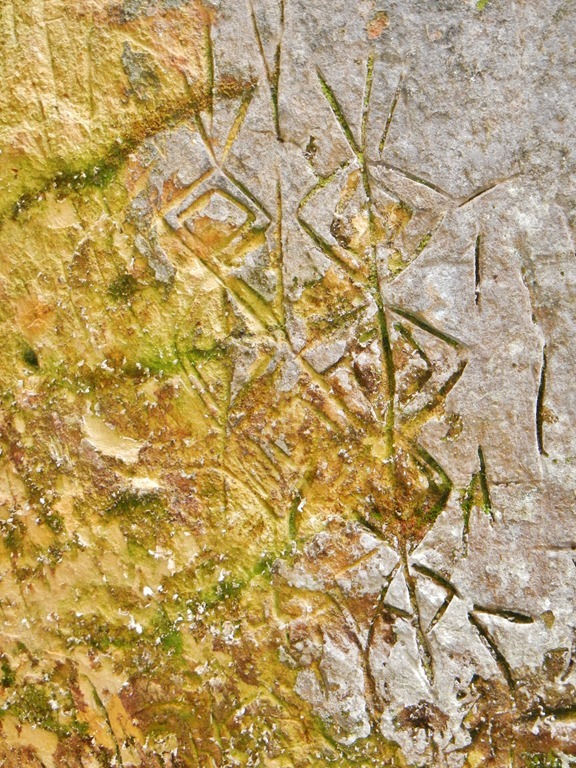 Lots of graffiti has been scratched into the friable rock over the years, including some that may have been carved by native people. 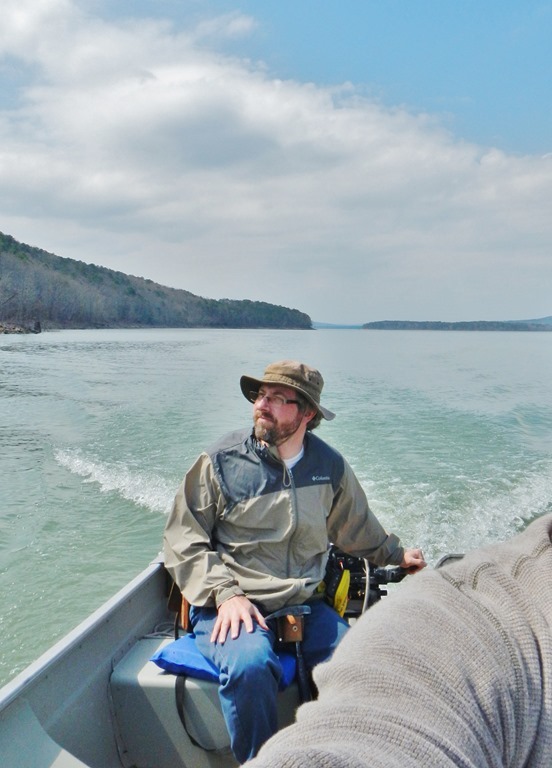 On Tuesday, we finished up our field work on the lake. We still had a couple islands we needed to visit, and the entire south side of the lake is so steep that access by land would be difficult. 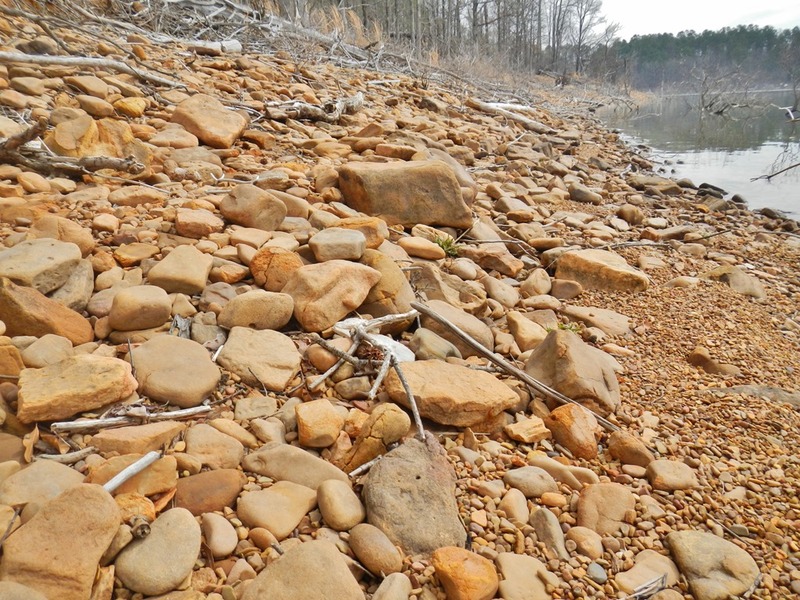 We were excited to find more old river terraces on the islands, including one that would have been deposited on a cut-off meander in the area of Harpers Cove. The deposit is about 80 feet above and over a half mile north of the current river channel (before the lake was there, that is). The high end of the range for the downcutting rate for the Colorado River in the western Grand Canyon is 16 centimeters/1000 years, and I think we can all agree that downcutting there probably exceeds that in Arkansas. Using that rate, an estimated 152,000 years would have passed since that terrace was deposited. That gravel has been there a long time! Of course, cutting off the meander would have stranded that deposit at that time, but don’t forget that this stream is developed in bedrock, so meander cut-off would be a fairly infrequent event. To get a better estimate of these events, methods such as luminescence dating are being developed to age date the sand in these stranded river terraces. 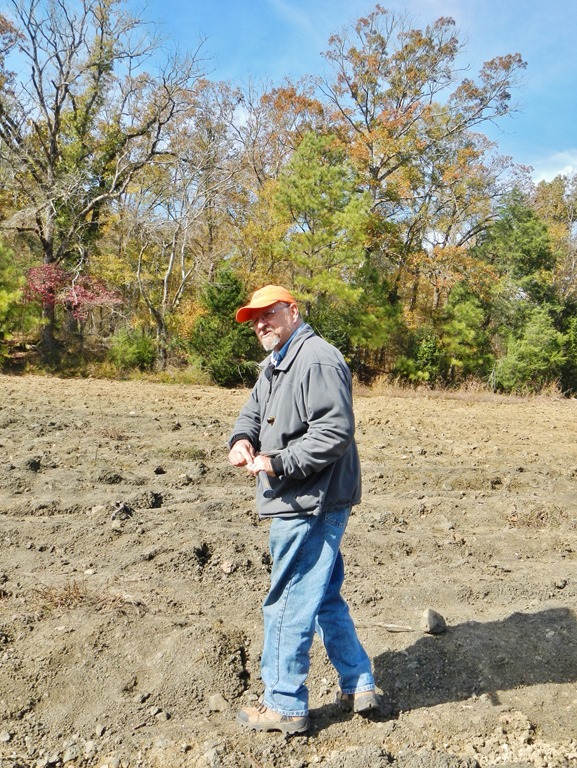 With this new technology, perhaps someday we will know when these terraces were deposited. On the south side of lake below Stevens Point is a good example of a modern landslide, and a bit of a cautionary tale. Sometimes clearing trees for roads and houses can have catastrophic results. The photo tells the story. 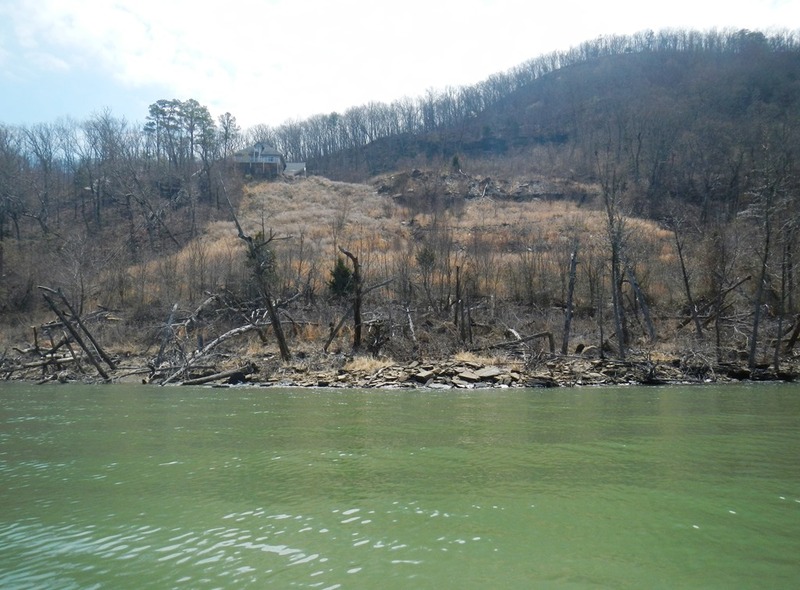 The major part of this landslide occurred March 28, 2005 just after a road was cleared from the house down to the lake. 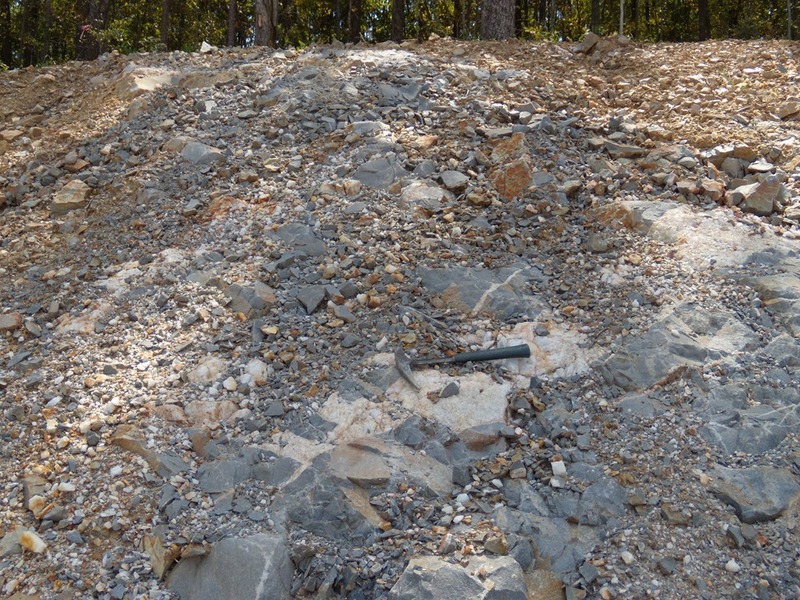 Most of the material at the edge of the lake on the north side of Hunter Mountain is there as a result of old landslides, therefore any development in this area can cause it to become unstable, as evidenced here. That’s why part of our project includes mapping areas where landslides have occurred. 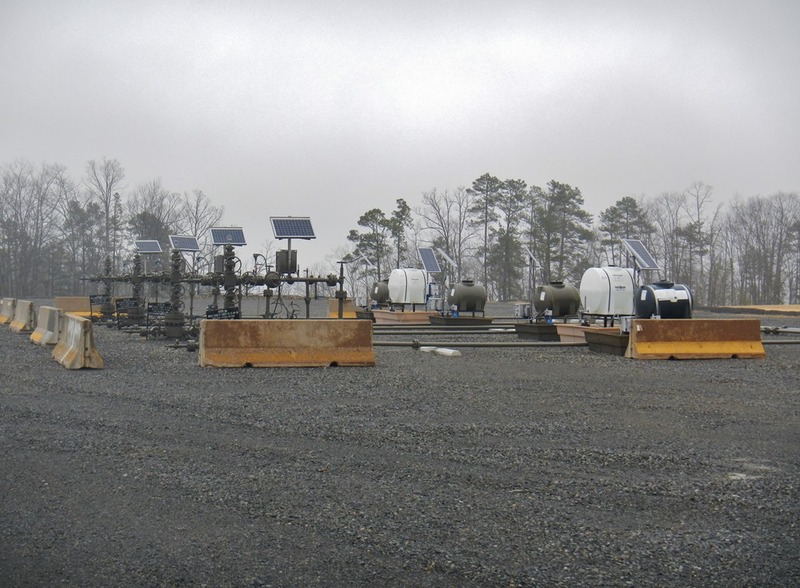 Speaking of Hunter Mountain, we ran across one of the now ubiquitous gas well pads up there, and I thought you might be interested to know the function of each piece of typical well head production equipment. At each wellhead is a set of valves that regulate the flow of gas. These are often controlled remotely, thus the solar panels which power the system. The big tanks near them contain hydrogen sulfide which is introduced into the gas right away to give it a strong odor. This odor is, of course, quite useful to determine if there are any gas leaks since natural gas is odorless. 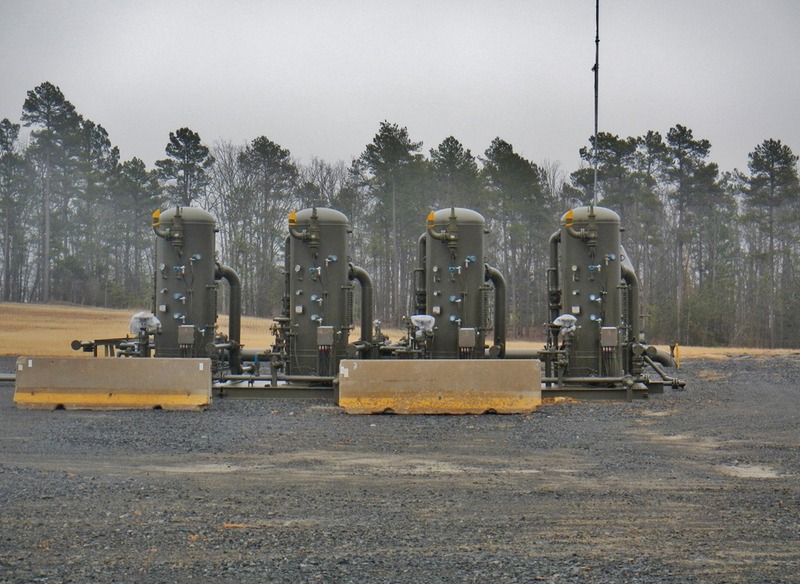 From the wellhead, the gas flows to the separators which remove any fluids contained in the gas. This fluid could include heavy hydrocarbons, but is mostly produced water. These fluids are stored in large tanks which are built inside a berm. 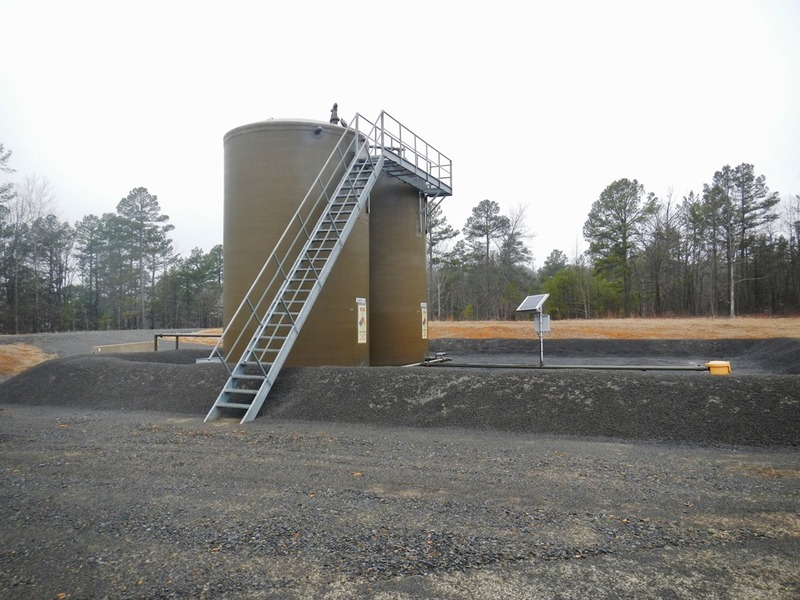 The berm is designed to hold 1 1/2 times the capacity of one of the storage tanks in case of a spill. The level in the tanks is also monitored remotely and emptied on a regular basis. From here, the gas is piped to a compression station where it undergoes further treatment. Then it is sent through a transmission line and on to your house. It’s not pretty, but for now, we have to have it. Well, next week will be the last of our field season. Until then, see you on the outcrop! 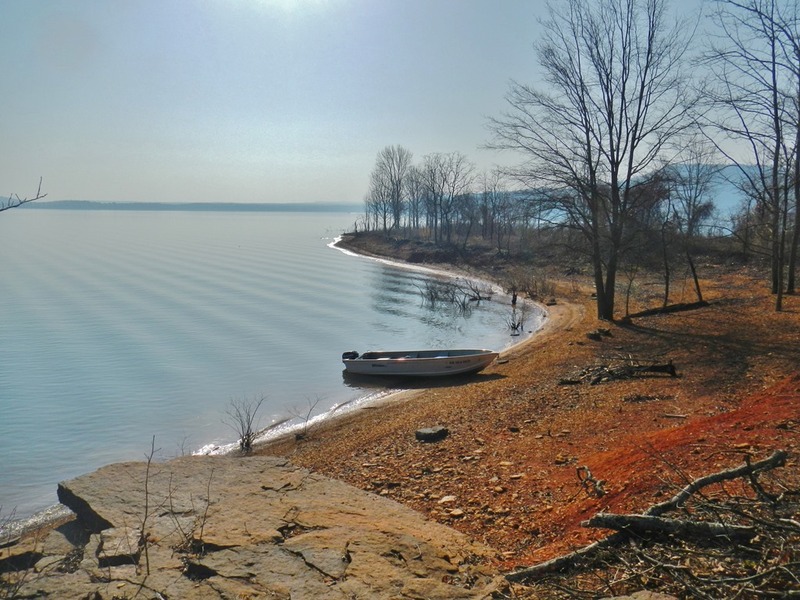 This entry was posted in Notes From The Field and tagged Arkansas, Bloyd, Boat Ridge Island, Fairfield Bay, Geology, Goose eggs, Greers Ferry Lake, Harpers Cove, Hunter Mountain, Indian Rock House, landslide, petroglyphs, Quartz, sandstone, separators, STATEMAP, Stevens Point, terrace deposits, wellhead on May 5, 2014 by argeology. The intersection of I-630 and I-430 is undergoing a major overhaul in west Little Rock, Arkansas. Excavation, during 2011 to the southeastern corner of this intersection, exposed a spine of Pennsylvanian Jackfork Formation sandstone and surrounding shale. Due to hardness of the sandstone at this location, it was decided to leave this rock outcrop and the name Big Rock Interchange was adopted. 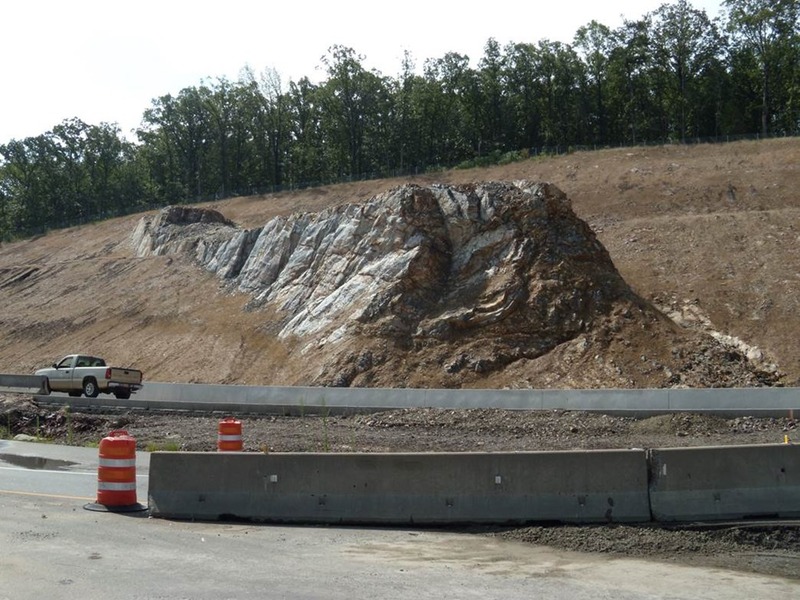 Anyone traveling through this interchange will be able to see this outcrop as it is very prominent. The Jackfork was deposited about 318 million years ago in a deep water marine environment by turbidites, landslides, and other mass wasting events some of which happened very rapidly while others very slowly. 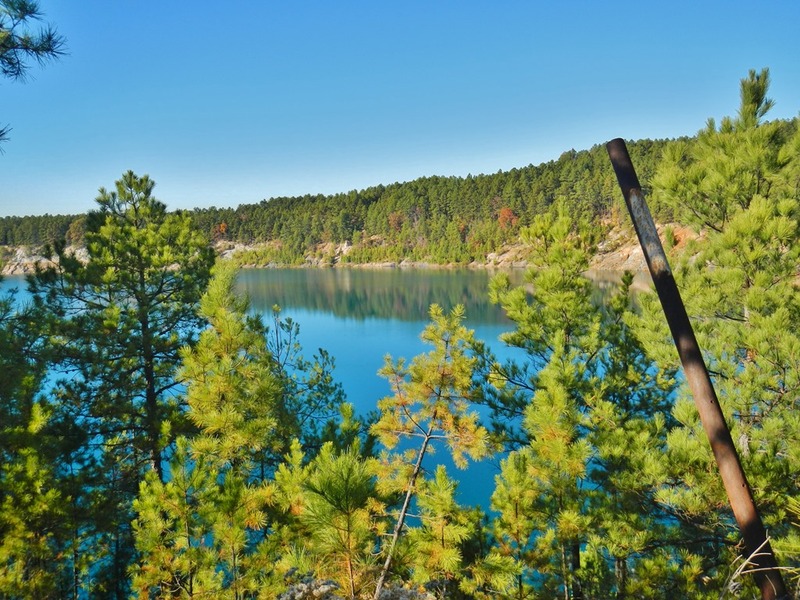 In total, the formation is about 6500 feet thick, was deposited in about 2.5 million years and is part of the Ouachita Mountain Physiographic Province. Deep water, in this instance, means 5 to 8 thousand feet deep. 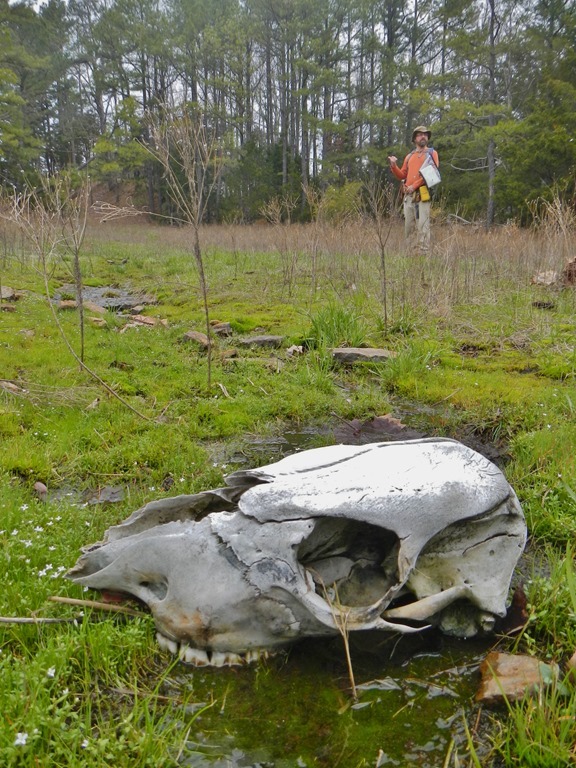 Fossils of any kind are hard to find in this type of environment. The sandstones at this site are harder than normal and have been upturned to the point they are almost vertical. The process of hydrothermal silica-rich waters passing through the rock in the distant past cemented the sand grains together well enough to now call the rock a quartzite. The difference between sandstone and quartzite is evident when broken. Quartzite breaks across the sand grains while sandstone breaks around the sands grains. A hand lens, magnifying glass or microscope is really needed to see this phenomenon. One may ask why the spine of sandstone is nearly vertical. This is due to tectonic plates colliding and deforming the rocks. 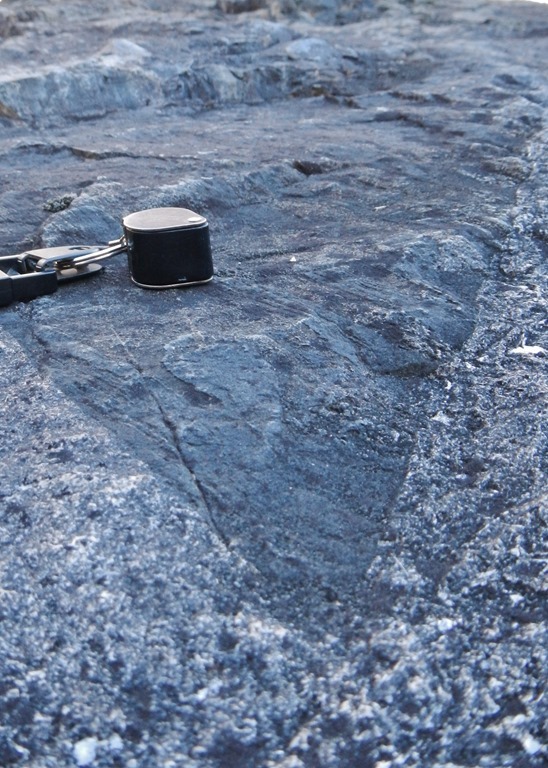 The collision between tectonic plates forming the super continent Pangaea caused folding and faulting as the rock in an ancient sea were pushed northward onto the North American tectonic plate. Fault gouge collected in 2011 suggest that a minor ancient fault occurs somewhere on this outcrop which is now hidden. At least two generations of quartz veining is evident at this site. Some veins are coarse-grained while others are finer-grained and they cut across each other. 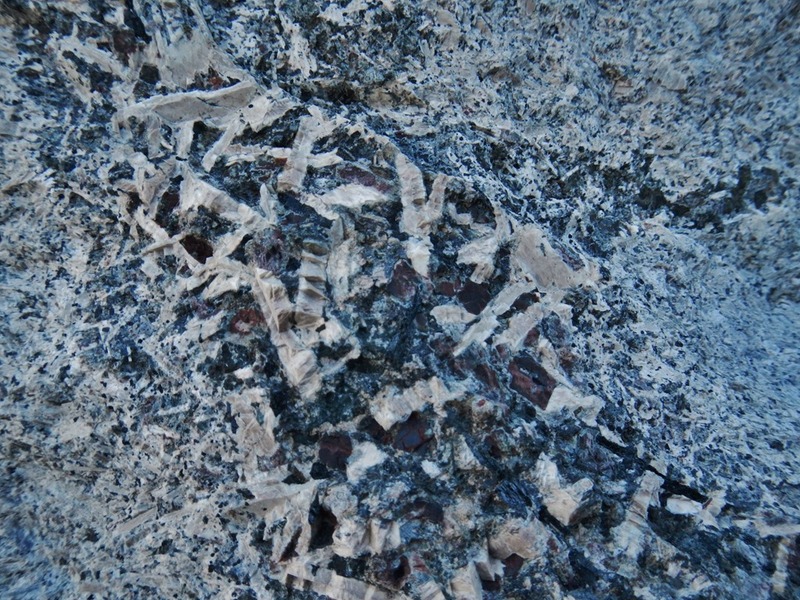 This is called cross cutting relationships and demonstrates that the quartz veining occurred at two different times. Cookeite, an accessory mineral, was deposited along with the vein quartz. 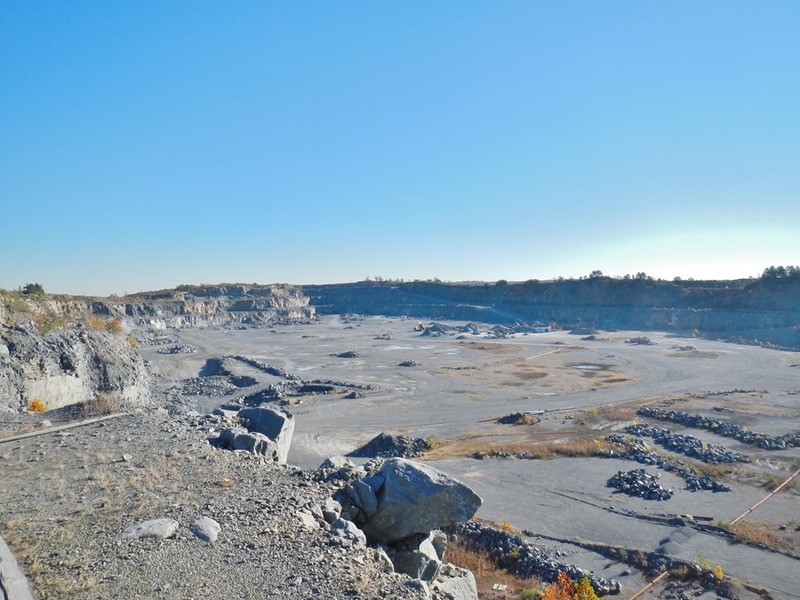 Cookeite, lithium-rich mica, is known to occur in the Little Rock/North Little Rock area. 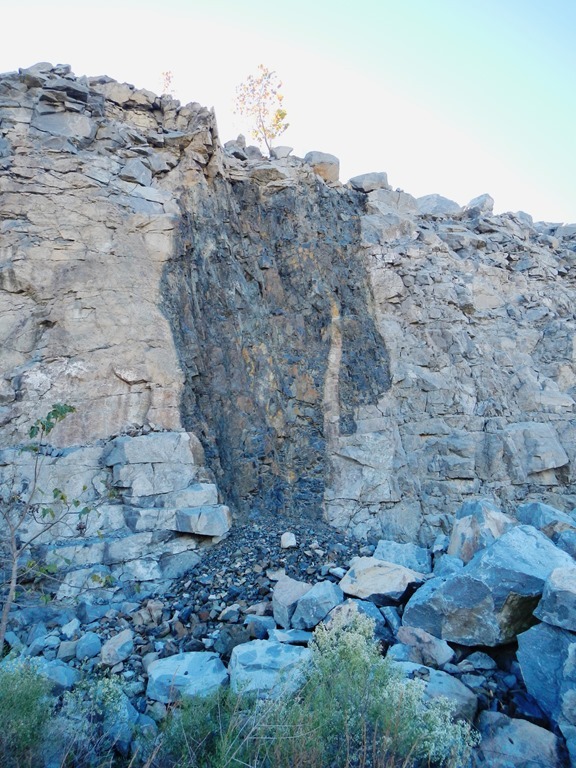 We found occurrences of Cookeite while investigating this exposure in 2011 in some of the quartz veins. When fresh, the Cookeite has a blue-green color and is less than 1/16inch in diameter. Additional places to view the Jackfork Formation in the local area are Pinnacle Mountain State Park, along Hwy 10 south of Lake Maumelle (Maumelle Chaotic Zone), Big Rock Quarry and the west side of the McCain Mall parking lot. These locations all have wonderful outcrops which display different depositional styles and settings and are very easy to access. One not so accessible outcrop of the Jackfork that many people see every day occurs along I-430 south of the Arkansas River. Along this section of roadway, Jackfork sandstone and shale beds are nearly vertical and make up the south limb of the Big Rock syncline. This entry was posted in Notes From The Field, Sedimentary Features and tagged Arkansas, Big Rock, Cookeite, Geology, Jackfork, Little Rock, Ouachita, Ouchita Mountains, Quartz, Quartzite, sandstone, Sedimentary on August 23, 2013 by argeology.